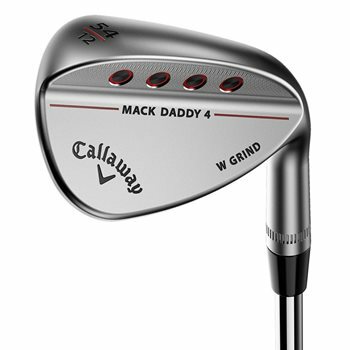 The Callaway Mack Daddy 4 wedge combines innovative performance technologies with premium components for optimum performance. After receiving extensive input from Tour players, industry legend Roger Cleveland used the feedback to create Tour refining shapes, soles, grinds and camber to give the MD4 wedges a more compact shape, straighter leading edge, tighter leading-edge radius and slightly more offset than the MD3 wedges. Callaway’s proprietary Groove-In-Groove Technology and Micro-Positive surface texture enhance spin and control while the combination of soft carbon steel, precise CG locations and crisp turf interaction provide a pure feel. The premium chrome finish is durable and Tour-inspired. The W Grind sole is wider at the center and toe and narrower at the heel, with moderate heel relief and generous front-to- back camber. This prevents digging without increasing bounce, and keeps the leading edge close to the turf at impact. The W Grind is great for open-faced shots.